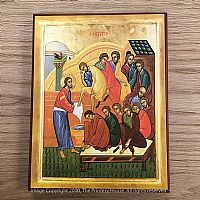 MCM103 6" X 10" ICON MATTED TO 11" X 14"
"Men of Galilee, why do you stand looking up toward heaven?" 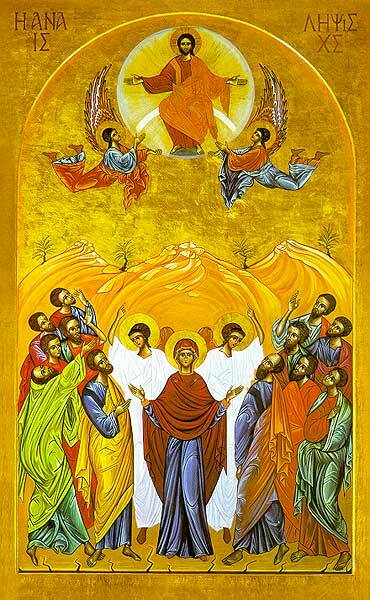 (Acts 1:9-11) Mary and the apostles witness the miracle of the Ascension, celebrated forty days after Easter each year as one of the major feasts of the Church. While he was going and they were gazing up toward heaven, suddenly two men in white robes stood by them. They said, "Men of Galilee, why do you stand looking up toward heaven?" 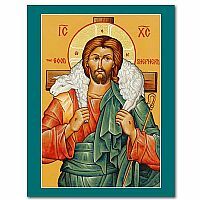 (Acts 1:10-11) The Feast of the Ascension is observed forty days after Easter, ending the Easter season and celebrating the culmination of Christ�s supreme act of salvation. 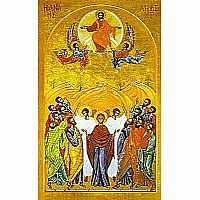 The feast has been commonly called "Ascension Thursday," although it has been moved to the following Sunday in some parts of the country. 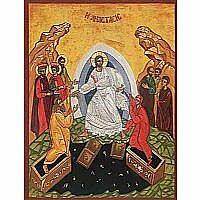 Sister Marie-Paul created the original of this Ascension icon very near to the location of the actual event atop the Mount of Olives. Her work conforms to ancient Byzantine tradition in its pattern and color choice, a design handed down for more than a thousand years. The mountains, the olive trees, and the cracked terrain set the scene at the Mount of Olives, a hill east of Jerusalem overlooking the city. The gold leaf background is symbolic of Divine light, gold being an incorruptible metal, reflecting light rather than possessing a specific coloration like paint. Jesus is shown in kingly robes, seated on a rainbow. Christ�s halo, the iconographic symbol for sanctity, is inscribed with a cross and the Greek letters omicron, omega, nu, spelling "HO ON." In English, this becomes "Who Am," the name used for God in Exodus 3:14. He is surrounded by a mandorla, symbolic of the high heavens, supported by angels. The angels emphasize His divine majesty. Jesus doesn�t need them for physical support, being quite capable of ascending on His own. The two lower angels in white are heavenly messengers as described in Acts, and their white robes in this composition provide a sharp visual contrast that sets Mary apart. 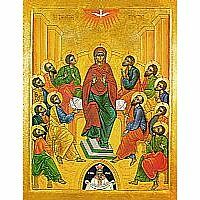 The Bible doesn�t explicitly place her at the Ascension, but ancient tradition includes her in the scene because she is specifically mentioned in Acts 1:14 as participating in prayer with the Apostles. Mary is presented to us in this icon as the traditional Virgin Orans, looking straight at the viewer with hands raised in prayer. Her formal, symmetric pose is quite different from those around her. 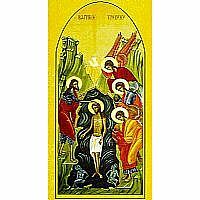 She, together with the Apostles, represent the "People of God," Christ�s church on earth. Further reinforcing this symbolism is the presence on Mary�s left of St. Paul, who could not have been historically present like St. Peter on her right, but was a central participant in the shaping of the early church. Because of Mary�s role as Theotokos or "God-bearer," the link between the divinity of Christ and His humanity, she represents here the formal church, linking God and His people.